The musical worlds of Scarlatti, Gesualdo, and Mozart intersect with the improvisatory genius of jazz composer and pianist Uri Caine, who is joined by virtuoso pianist Jenny Lin in an album of adventurous music for one and two pianos. "There’s more than a little witchcraft at work on this lovely and playful recording: Pianists play duets with each other, even though they are in different rooms and at different times when they do so. Ms. Lin, a classically grounded pianist, and Mr. Caine, a noted jazz improviser, put Steinway’s new Spirio player system to the test in these virtual jam sessions. Ms. Lin performs a selection of works and arrangements of Scarlatti, Mozart and Gesualdo, to which Read more Mr. Caine adds jazz-inflected improvisations. The result is a wonderfully tender conversation between the past and the present." This project by American pianist and composer Uri Caine is noteworthy in at least three ways. First is the compositional concept, which is unique. Much of the program consists of familiar classical pieces in two-piano versions, with the pieces performed in their usual version by Jenny Lin while Caine creates an improvised accompaniment. Some of these, by Domenico Scarlatti, are keyboard pieces; the first movement of the Mozart Piano Sonata in C major, K. 545 is done differently, with the unadorned version played first, followed by Caine's improvisation. There are also keyboard versions of madrigals by Carlo Gesualdo; Caine provides an improvised accompaniment here as well. Second is the technology denoted by the title. 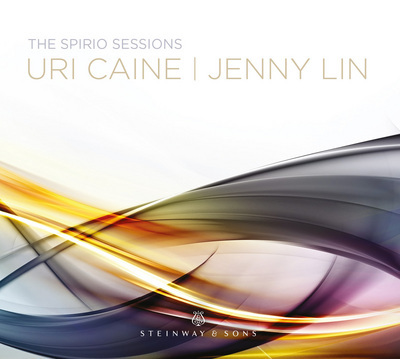 The Spirio system is a new high-resolution reproduction technology being developed by Steinway, and neither the two-piano duets on the album nor even the final recordings were made in real time: the duets in which Caine improvises on the pieces played straight by Lin were recorded at different times, and even the album itself was assembled from Spirio playback. Lastly, there are original pieces by Caine for one or two pianos; the former are through-composed, while in the latter he improvises on his own music, played by Lin, in the same way he treats the Scarlatti sonatas. This is unusual in itself, and what's more, Caine mixes tonal and atonal idioms, treating them both as details rather than as foundations of a musical language more oriented toward rhythm and motivic work. The program does not entirely hang together -- it's not clear why the method should change with the Mozart sonata at the end, for example -- but this is a stimulating experiment. Decide for yourself whether the recording sounds like it captures the sounds of musicians in the studio! Recommended. Date of Recording: 8/12-14/2014 Venue: Steinway Hall, New York City Length: 2 Minutes 53 Secs. Date of Recording: 8/12-14/2014 Venue: Steinway Hall, New York City Length: 3 Minutes 0 Secs. Date of Recording: 8/12-14/2014 Venue: Steinway Hall, New York City Length: 1 Minutes 22 Secs. Date of Recording: 8/12-14/2014 Venue: Steinway Hall, New York City Length: 2 Minutes 9 Secs. Date of Recording: 8/12-14/2014 Venue: Steinway Hall, New York City Length: 1 Minutes 31 Secs. Date of Recording: 8/12-14/2014 Venue: Steinway Hall, New York City Length: 2 Minutes 34 Secs. Date of Recording: 8/12-14/2014 Venue: Steinway Hall, New York City Length: 1 Minutes 19 Secs. Date of Recording: 8/12-14/2014 Venue: Steinway Hall, New York City Length: 1 Minutes 40 Secs. Date of Recording: 8/12-14/2014 Venue: Steinway Hall, New York City Length: 1 Minutes 36 Secs. Date of Recording: 8/12-14/2014 Venue: Steinway Hall, New York City Length: 3 Minutes 23 Secs. Date of Recording: 8/12-14/2014 Venue: Steinway Hall, New York City Length: 1 Minutes 12 Secs. Date of Recording: 8/12-14/2014 Venue: Steinway Hall, New York City Length: 0 Minutes 54 Secs. Date of Recording: 8/12-14/2014 Venue: Steinway Hall, New York City Length: 1 Minutes 23 Secs. Date of Recording: 8/12-14/2014 Venue: Steinway Hall, New York City Length: 3 Minutes 50 Secs. Date of Recording: 8/12-14/2014 Venue: Steinway Hall, New York City Length: 2 Minutes 49 Secs. Date of Recording: 8/12-14/2014 Venue: Steinway Hall, New York City Length: 1 Minutes 35 Secs. Date of Recording: 8/12-14/2014 Venue: Steinway Hall, New York City Length: 1 Minutes 8 Secs. Date of Recording: 8/12-14/2014 Venue: Steinway Hall, New York City Length: 1 Minutes 0 Secs. Date of Recording: 8/12-14/2014 Venue: Steinway Hall, New York City Length: 2 Minutes 16 Secs. Date of Recording: 8/12-14/2014 Venue: Steinway Hall, New York City Length: 2 Minutes 57 Secs. Date of Recording: 8/12-14/2014 Venue: Steinway Hall, New York City Length: 2 Minutes 35 Secs. Date of Recording: 8/12-14/2014 Venue: Steinway Hall, New York City Length: 1 Minutes 30 Secs. Date of Recording: 8/12-14/2014 Venue: Steinway Hall, New York City Length: 2 Minutes 6 Secs. Date of Recording: 8/12-14/2014 Venue: Steinway Hall, New York City Length: 0 Minutes 57 Secs. Period: Classical Written: 1788 Vienna, Austria Date of Recording: 8/12-14/2014 Venue: Steinway Hall, New York City Length: 3 Minutes 17 Secs. Date of Recording: 8/12-14/2014 Venue: Steinway Hall, New York City Length: 4 Minutes 44 Secs.